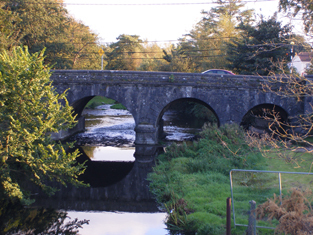 February 1st – Feast of St Brigid of Kildare, and traditionally the start of spring in a freezing cold Ireland! February 1st is celebrated as the Feast of St Brigid of Kildare in Ireland. Brigid is one of the three patrons of Ireland along with St Patrick and St Colmcille (or Columba if you’re a Scot). These three essentially make up the Irish ‘Holy Trinity’. One of the medieval legends of Ireland held that at the Last Judgement everyone has to go to Jerusalem to be judged by Christ. 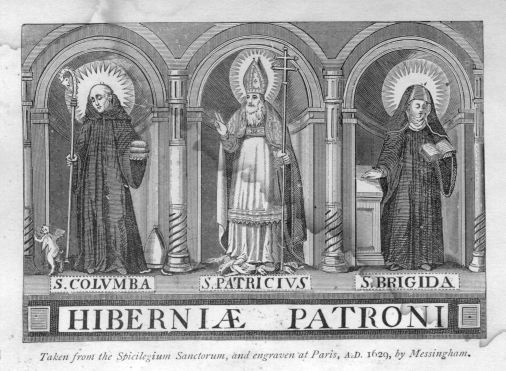 The Three Patron Saints of Ireland. Unfortunately for Ryanair, this will not apply to the Irish – because they have to gather in Armagh to be judged. And the judges will be the three members of the Irish ‘Holy Trinity’ – Patrick as president of the tribunal, with Brigid and Colmcille as assisting judges. The authority of this tribunal would be symbolized by the Bacal Isu – the staff that was said to have been given to Patrick by Christ. This is the same staff that Christ used in his travels about the Holy Land and it had been used by Moses to part the waters of the sea to allow the Hebrews to escape from Pharaoh. During the medieval period this staff was preserved in Christchurch Cathedral in Dublin. Archbishop Browne (the first ‘reformed’ archbishop of Dublin) is said to have burned it in the late 1530s, but he denied this when questioned by the government of the day. In short, the staff disappeared, presumably until the Last Judgement. The (French?) 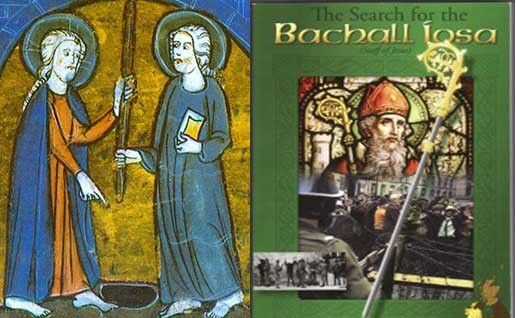 medieval manuscript illumination is probably a more accurate depiction of the Bacal Isu or Bachall Iosa when compared with the modern book cover on the right. The Bacal has even starred in a popular fantasy/triller by an American writer! Daring! Back to Bridie (the affectionate version of her name!). February 1st is also seen in Ireland as the first day of spring. Now, before all the meteorologists get upset by this bit of folklore, I must admit that I am perfectly well aware that the met people here insist on starting spring on 1st March. The idea of spring starting on 1st February has a stronger grip on the popular Irish division of the year than the scientific notion of starting the season on 1st of March or ever on 21st of March. Life, you see, is made up of more than just scientific facts! Messy custom and folklore can be a stronger fact of life! One difficulty that raises suspicion is the coincidence of her feast with the ancient festival of Imbolc. Imbolc was one of the cross-quarter days of the Celtic year, being half way between Samhain and the spring equinox, but also between Samhain and Beltaine (now fixed as 1st of May, the first day of summer). Imbolc was the festival of the goddess Brigit. It is likely that there has been serious conflation of the goddess with the saint, but I’m taking it that Brigid of Kildare was a real person. Saint Brigid was seemingly born as the daughter of a slave and her master. Brigid was noted for her household husbandry – that is, she knew how to keep a good house. When she wanted to set up a monastery on the plain by the Curragh, she was jokingly offered land by a local chief in Kildare – but only as much as her cloak would cover. When Brigid placed her cloak on the ground, it suddenly expanded as far as the eye could see. 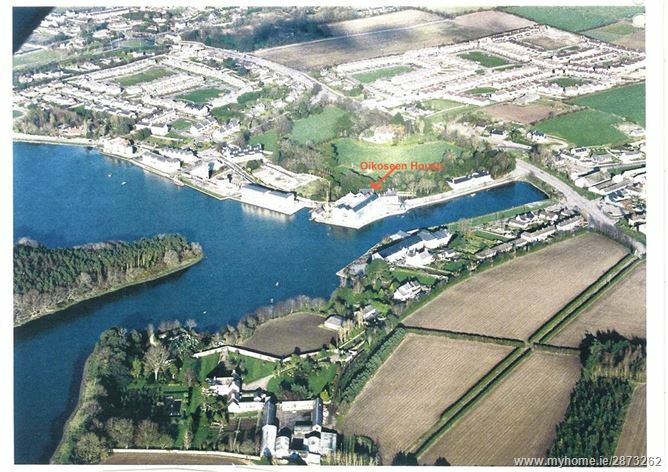 The chief was clearly one who would never have made a good bargain during the Celtic Tiger years! 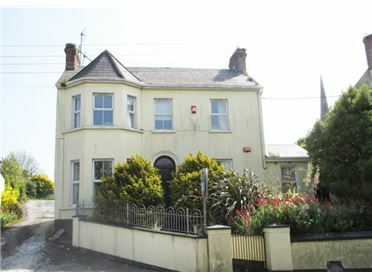 Certainly St Brigid would be an ideal candidate as patron saint of property speculators! 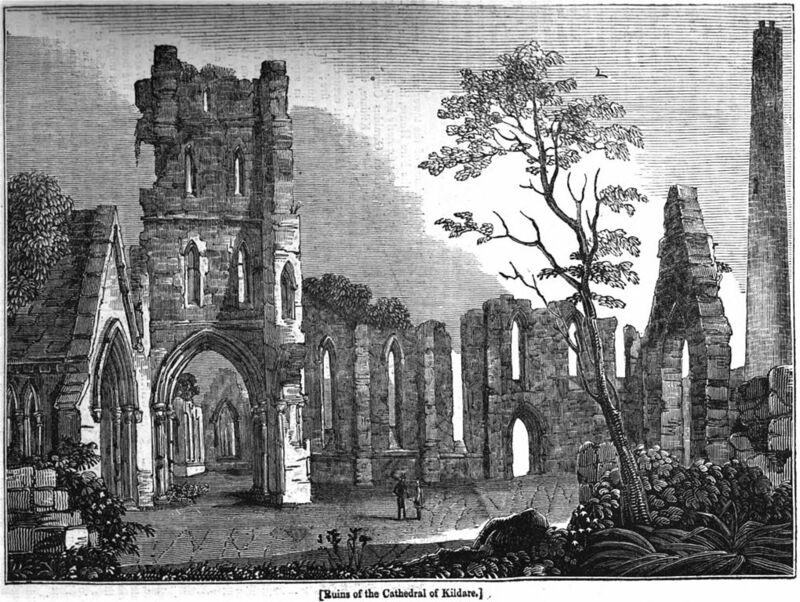 Kildare Cathedral in ruins about 1800. St Brigid’s cult spread beyond Ireland – St Bride’s church in Fleet Street, London, is dedicated to her. Her cloak apparently ended up in Bruges, and one of her shoes in Lisbon. There is a fine reliquary for another shoe in the National Museum of Ireland – she really had very dainty feet! There are even places in Germany named after her – we know they take their name from Brigid of Kildare (or Ireland) because they existed before the canonisation of St Bridget of Sweden (her name was actually Birgitta, not Brigida, indeed the Swedish name has nothing to do with Brigid of Kildare). However some of the cult centers of the Irish Bridie ended up being associated with the Swedish saint in later years. Oh woe, the ignorance! 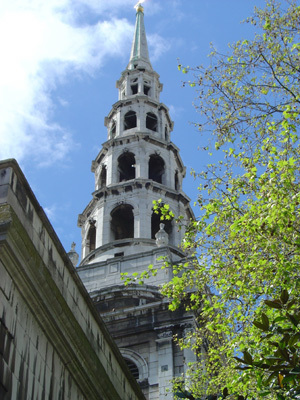 Sir Christopher Wren’s spire on St Bride’s Church, Fleet Street, London. This church is the spiritual home of the media in London because for much of the 19th and 20th centuries the headquarters of the major British newspapers were on Fleet Street. There has been a church on the site since the seventh century. 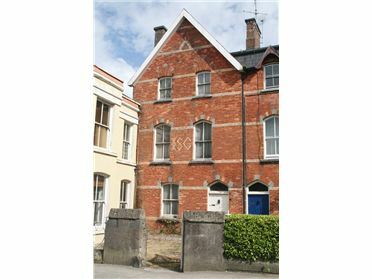 Wren’s church is the seventh one on the site dedicated to St Brigid of Kildare. Wren’s church was built after the Great Fire of London in 1666. 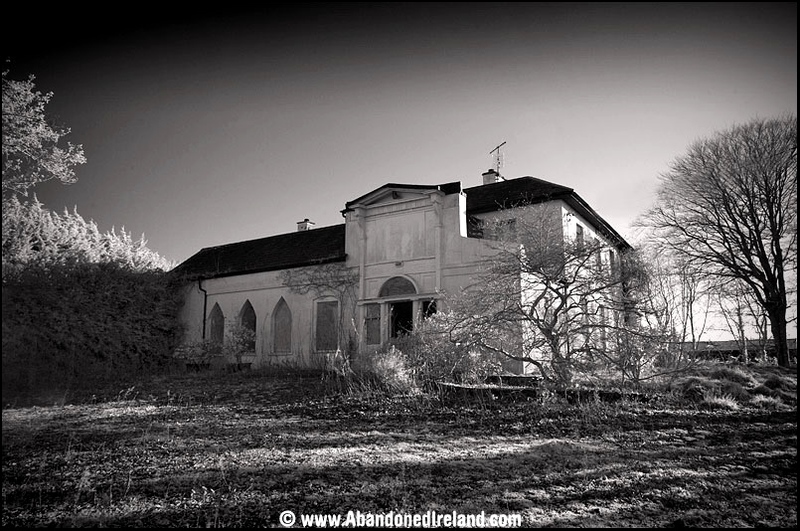 Brigid’s monastery was a double house – of monks and nuns, with an abbess in charge of both. There was a bishop attached to the monastery, but he was under the thumb of the abbess. The wooden church in the centre of Brigid’s monastery was really a large timber basilica with painted walls. The round tower is the only part of the original monastery to survive, except for the ground plan of the precincts that can be traced on maps. 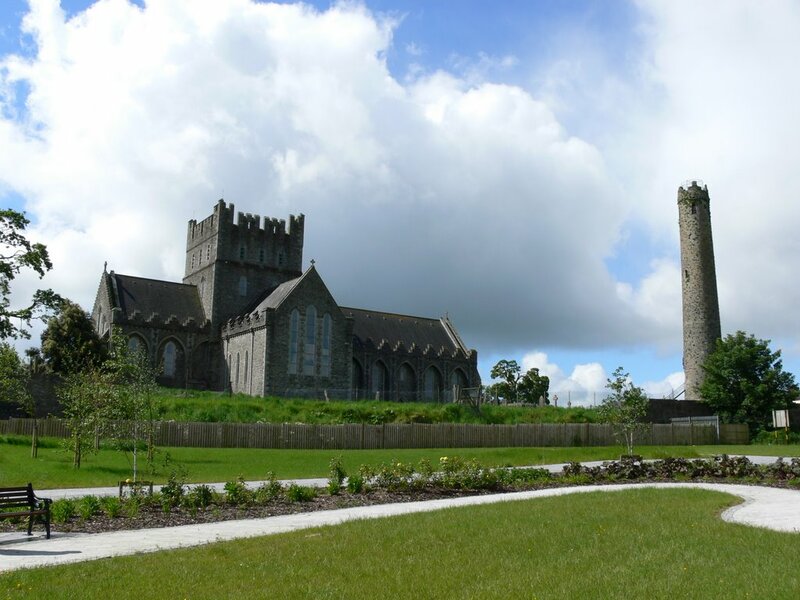 Today the wooden basilica has been replaced by a medieval cathedral which was heavily restored for use by the Church of Ireland in the nineteenth century. Happily the original appearance and dimensions of the medieval structure were respected during the restoration. Kildare Cathedral was restored in the later 19th century. 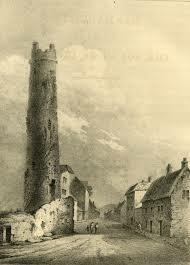 The round tower is still the tallest structure in Kildare village – apart from the spire of the Carmelite church! The Irish tradition is to hang a St Brigid’s cross in the house on the 1st of February. These crosses are made of rushes, apparently devised during an idle moment when Brigid was looking after a sick chieftan who converted to Christianity on his recovery. Brigid is also associated with cows – although such images are more likely to be late medieval German than Irish. Still, cows were important to the Irish economy in the early medieval period. St Brigid’s Cross, made of rushes. 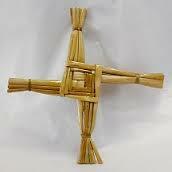 A traditional decoration associated with St Brigid’s Day. 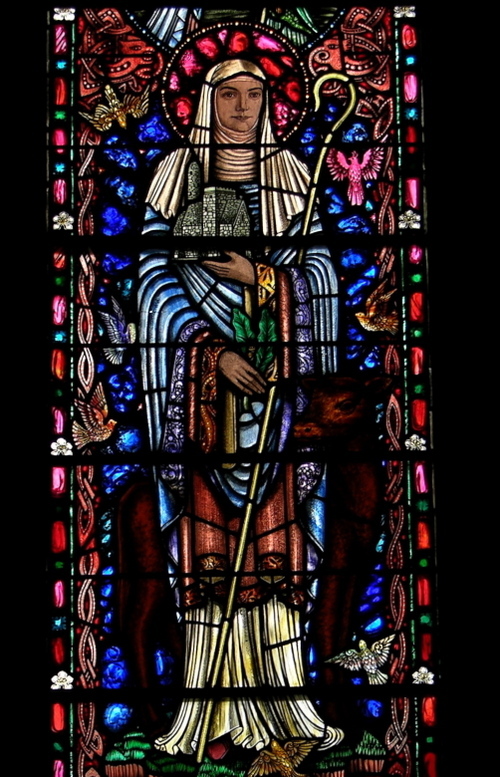 St Brigid of Kildare by Harry Clarke Studios. 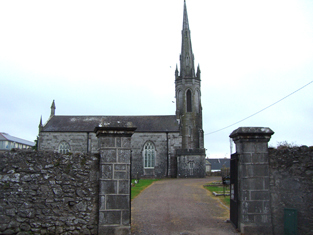 The church held by the saint signifies her role in founding the church at Kildare. The calf alludes to her role in protecting cattle. 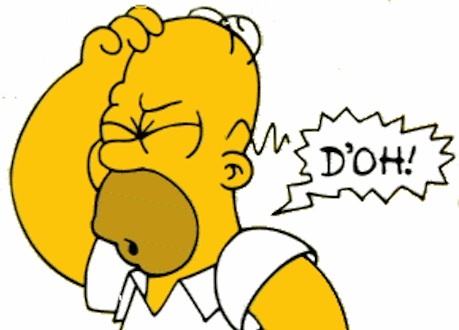 There is, however, just one problem…..St Brigid’s feastday can be bitterly cold. Indeed we are going through a cold spell at the moment, with the prospect of temperatures going to minus 8 degrees centigrade! Spring is on hold it seems! No wonder lighting a fire was part of the ritual of Imbolc – and Brigid’s monastery of Kildare was associated with a Holy Fire! All the better to ward off the bitter winds of late winter and early spring – especially today’s north westerly winds! The sinking of RMS Lusitania in May 1915 – A personal recollection. RMS Lusitania which won the Blue Riband for the fastest crossing of the Atlantic by a liner. She was torpedoed 11 miles off the Old Head of Kinsale on 7th May 1915. With the commencement of World War I commemorations in 2014, it is appropriate to mention a local commemoration in the south-east Cork area. 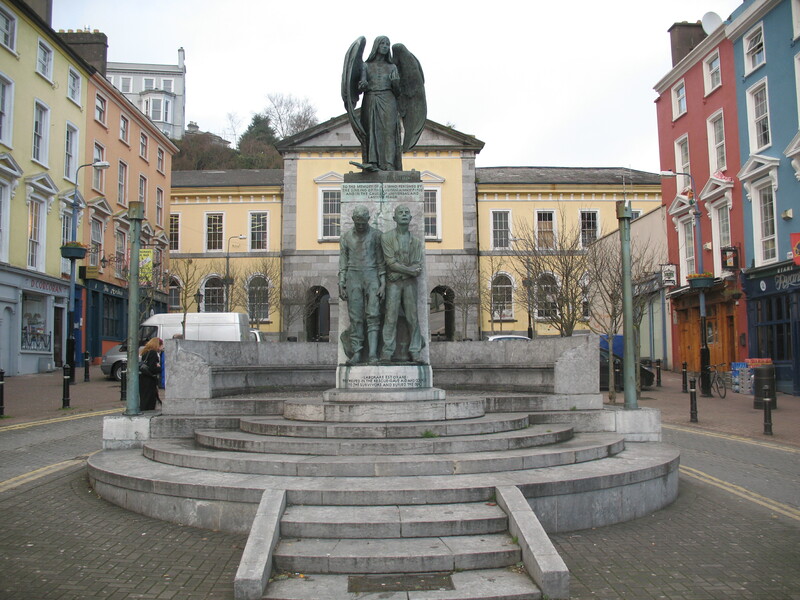 Cobh, formerly Queenstown, will commemorate the centenary of the sinking of the RMS Lusitania. This fast passenger liner, en route from New York to Liverpool, was torpedoed about 11 miles off the Old Head of Kinsale by U-20 shortly after 14.10 hours on 7th May 1915. What happened next is debated, but the ship sank so rapidly that only that only six of her lifeboats could be launched successfully. Of the 1959 passengers and crew aboard her, only 764 were rescued despite the best efforts of local Irish fishermen who sailed to assist. Recruiting poster issued by the British government for use in Ireland. 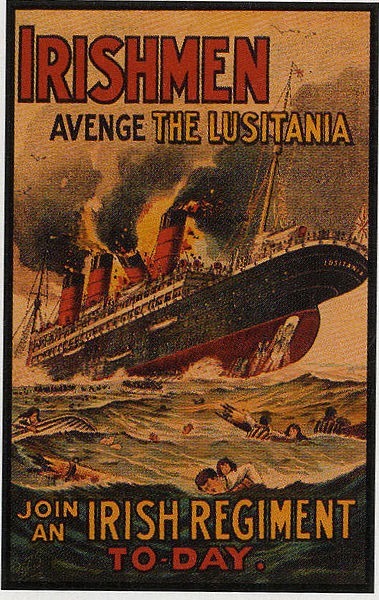 The sinking of the Lusitania caused outrage in Ireland. The Irish fishermen who went to assist the survivors did not have modern fishing vessels. Most of their boats were powered by sail or, more rarely, by a steam engine. This meant that they could be slow to get the the site, thus increasing the distress of the survivors struggling to combat hypothermia in the cold waters. 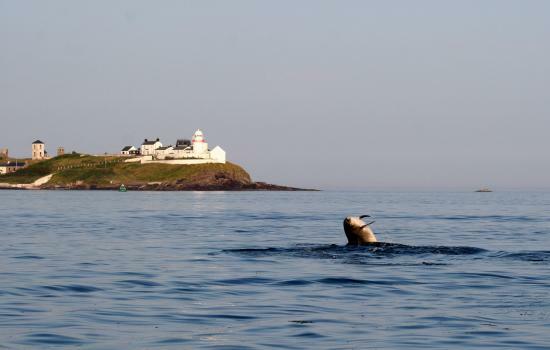 Hypothermic shock was likely the biggest killer of the survivors – the seas around Ireland can remain cold until June – and even then they need a long spell of warm weather to make the water just about bearable. Most of the survivors were conveyed to Queenstown, the principal base for the Royal Navy on the south coast of Ireland, and the center commanding the rescue operations. In Queenstown, the survivors were cared for in hospitals and lodged in hotels and guest houses. 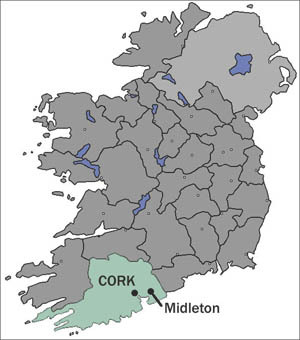 In the days following the sinking, bodies washed ashore all over west Cork, but most of the bodies that were recovered were interred in mass graves in Queenstown, although a small number were interred in Kinsale, which was closer to the site of the sinking. The majority of the victims were never recovered. 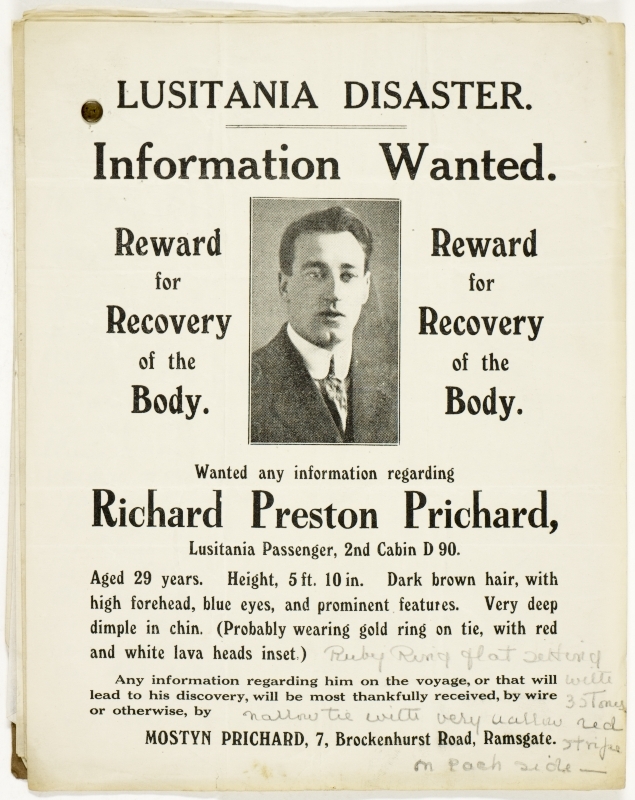 Most of the victims of the Lusitania were never recovered. This poster shows how desperate people were to recover just the remains of their loved ones. At the time the US newspapers published details of the ship’s manifest and munitions and war materiel were clearly stated to be aboard the ship. However in Britain and Ireland this information was suppressed. Indeed many people in Ireland remain ignorant to this day of the RMS Lusitania’s official status as an Auxiliary Merchant Cruiser – she was so listed in Jane’s Naval Ships in 1914. The Lusitania was not just built with private funds – but her construction and operations were subsidized by the British government (RMS means Royal Mail Ship – the Lusitania was contracted to carry letters and parcels for the Royal Mail – a useful subsidy). 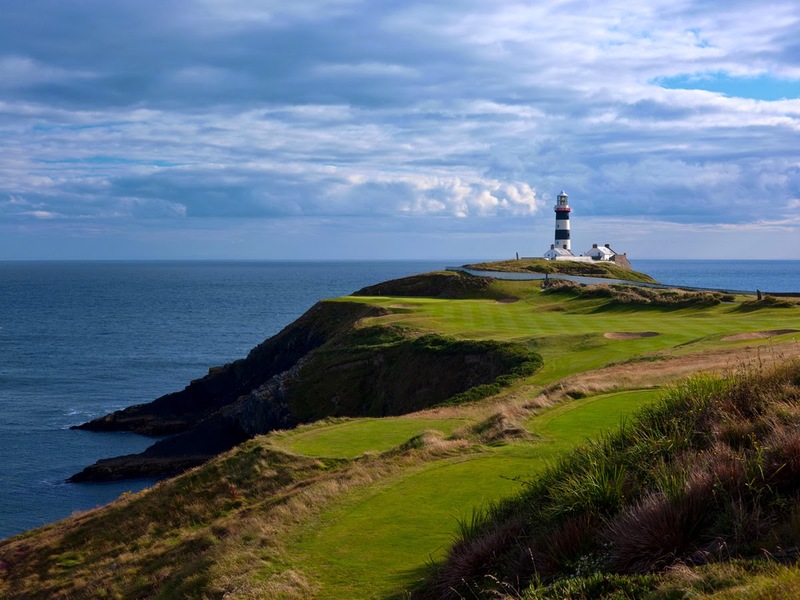 Roches Point lighthouse, not far from Midleton, marked the nearest safe haven for a vessel the size of the Lusitania – Cork Harbour. On her maiden voyage, Lusitania, like Titanic, stopped offshore to take on passengers from Queenstown. One controversy about the Lusitania concerns the ‘second explosion’. Kaiptanleutnant Walther Schwieger, commander of U-20, recorded that he only fired one torpedo and was reluctant to fire a second in the the struggling mass of humanity struggling in the water. Yet there was a second explosion – this is clear now. It wasn’t widely known when I was growing up. Yet, I have personal testimony that supports one view of the sinking. Years ago we had a neighbour, Mr Patrick Donovan, who was a retired Garda (Irish police officer). Pat grew up near the coast not far from the Old Head of Kinsale. Once, when I visited him in the late 1980s, he told me of his experience the sinking of the Lusitania. His memory was slightly hazy about the events of May 1915, but only slightly – this man remained lucid to the end of his life, and he was very clear on certain points. The view from the Old Head of Kinsale towards the area where the Lusitania sank in 1915. Why do I remember this conversation so vividly? Simple, my neighbour had contradicted everything I knew about the Lusitania – and he was very clear about the second explosion. Curiously it would be several years before the story of the second explosion became more widely known and the theories that were put foward ranged from a coal dust detonation to suspicion of munitions going off. The British hoped that the loss of so many American lives aboard he Lusitania would propel he US into the war – this has led to speculation that Winston Churchill as First Lord of the Admiralty had deliberately put the ship in harm’s way to achieve an American entry into the war. I think it seems too farfetched – the Lusitania was a fast vessel, having held the Blue Riband for the fastest crossing of the Atlantic. It was assumed she would outrun any submarine. But she couldn’t outrun a submarine that just accidentally stumbled upon her. She was simply in the wrong place at exactly the wrong time. The Lusitania Memorial in Cobh, by Jerome Connor, with stone carved by Seamus Murphy, is actually unfinished. In a way it is oddly appropriate since the ship didn’t complete her voyage in May 1915. The two figures at the front commemorate the fishermen who rescued survivors and retrieved bodies. Keep you eyes open for the commemorative events in Cobh this year! 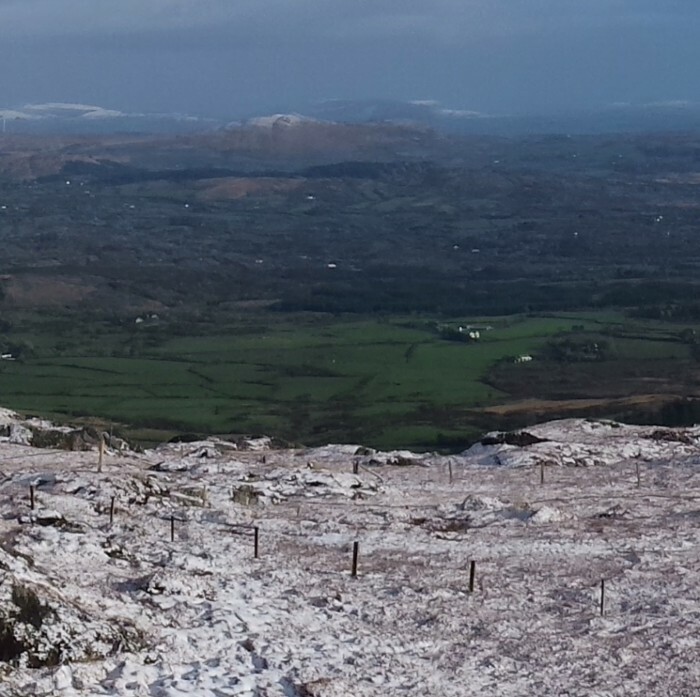 Snow in the Mushera hills near Millstreet County Cork. Photo by Donal Cashman. I’m currently preparing a post for later in the week but to fill in the gap I thought I’d let you know, in case you haven’t noticed or heard, that winter has arrived in Ireland. Now before you all get uppity and say that winter started on 1st November (if you’re Irish) or 1st December (if you’re a meteorologist) let me explain. The weather since 1st November in Ireland has generally been warmer and more settled than usual, and not particularly wet either. We’ve had a few days of rain, to replenish our water supply (most welcome) and some days of wind (handy for drying the laundry) and many days of lovely, if cool, sunshine (great for getting my vitamin D fix!). There has been very little frost at night, and hardly a repeat of last winter’s gales – in short we’ve been very lucky. In fact it has been so mild that I noticed some buds on the trees! I went for a walk on Christmas morning and discovered that a very large number of people were doing the same thing – and it felt more like a spring day rather than winter. It’s been like that since Christmas, in fact. But in the last few days we could sense a change – it’s colder, the winds are more frequent and there’s been rain. 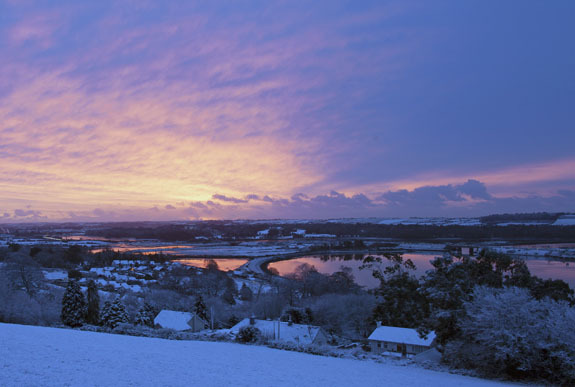 Today the north and west of the country woke to snow – and we had snow showers here in Midleton too. Met Eireann has issued an orange weather alert – but this is more to do with the Irish inability to drive on iced up or snow-covered roads. There is also a warning of high winds – this is much more serious – Carrigaline lost power yesterday due to wind damage to power lines. it difficult to respond when there’s more than a few centimetres of snow on the ground for a few days. There’s already a report of a multivehicle collision on the main road from Cork to Limerick near Blarney. 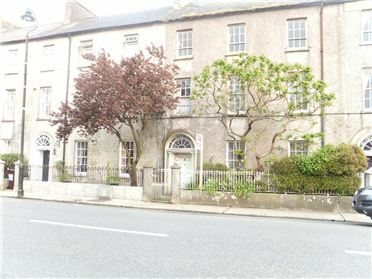 So far the only problem in Midleton has been the loss of connection to the National Lottery – the ticket machines on Main Street were unable to print out tickets for tonight’s Euromillions draw! Oh, and the snow that fell promptly froze, especially on cars! Hardly a crisis, but winter is definitely here. Snow? What snow? It’s there….on the horizon. View from Mount Gabriel in West Cork at lunchtime today. Mount Gabriel is the site of some of the oldest copper mines in Ireland. It also houses the radar station that guides aircraft across the Atlantic – in both directions. And how appropriate that the snow fell on 13th January – the feast of St Hilary of Poitiers and traditionally the coldest day of the year! The feast was the traditional date for the resumption of law terms in the courts after the Christmas break and for the resumption of studies at university before the general adoption of the American semester system. Hilary Term was the period between January and the Easter break. 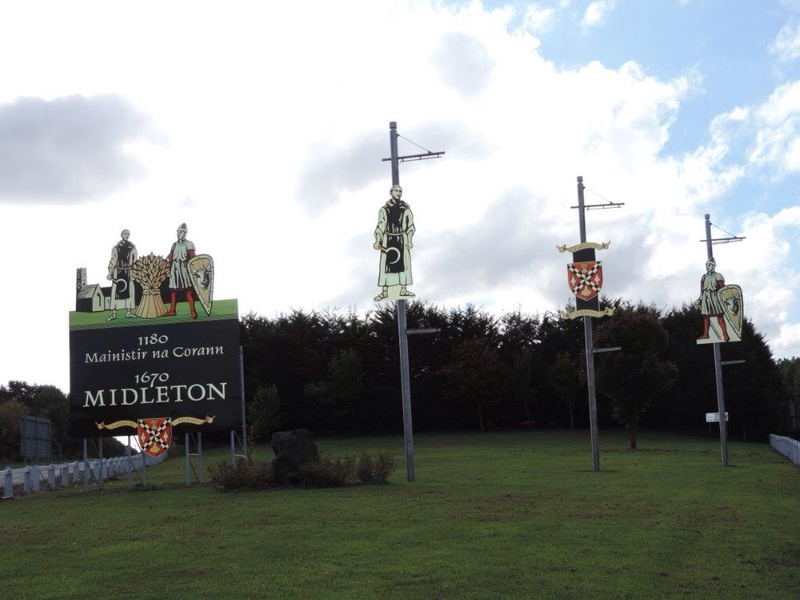 As you know from a previous post, I presented a course of six two-hour classes called Research Your Family History at St Colman’s Community College in Midleton from October to the beginning of November 2014. It proved quite successful, especially with the particular format that I used. Beginning on Wednesday 4th February 2015 I propose to present another course but this time I have called it Practical Genealogy and Family History. 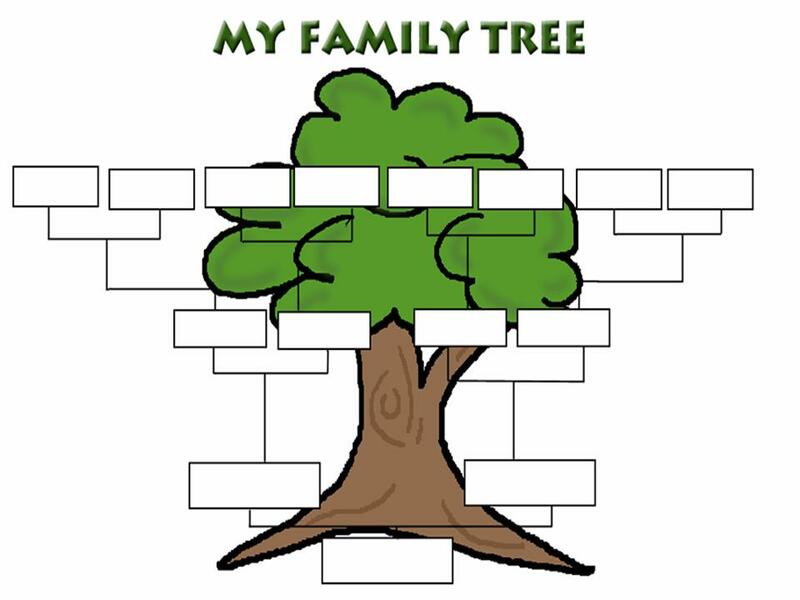 The emphasis is on the practical side of researching one’s family history and lineages (we all have at least two lineages – from Mon and from Dad!). I propose to follow the format that I previously used but will reveal that to the class as it assembles. The classes are scheduled to take place on Wednesday nights from 7.30 pm to 9.30 pm and will run for six weeks. Anyone wishing to avail of this course should attend the Enrollment Night at St Colman’s Community College on Thursday 15th January between 7.30 and 8.30 pm. I plan to be there and will answer any queries that prospective students might have. Note that enrollment closes on Friday 30th January.